Bug, bugs, and more bugs have been invading our home lately. The workers doing our master bedroom/bathroom remodel are always going in and out so the door is constantly open and lots of little critters have been coming into our house. My kids are now outfitted with bug nets, bug magnifiers, and bug boxes from the Target $1 Spot. Over the weekend we channeled the enthusiasm for bugs and used it to help us do some counting and number recognition activities with a Number Bug Sticky Wall. Here's what you'll need: contact paper, painters tape, sharpies, cardstock, and flat surface to stick the contact paper. We did this activity a few times and with a few different sticky walls (I didn't love the first set of bugs that I drew). Punch or cut out different shapes from cardstock and write numbers on them! On the non-sticky clear side of the contact paper, draw several bugs with your Sharpies. Make sure that the cut out shapes can fit on the bugs. Write numbers on the bugs (remember to write them in reverse since you'll be turning the sticky wall around). Turn the sticky paper around and tape the non-sticky side to the wall while peeling off the sticky side. This takes me a good deal of concentration and focus to make sure I do it right and get everything taped down. Once the sticky side is facing out and your sticky wall is hung, pass your child some of the cut out cardstock shapes (we used punched circles) and let her start matching numbers while building the bugs! I tried to make it so that each bug had the same number of body parts as their number circles, but not all of them panned out that way. Being creative while also holding onto a grumpy teething baby makes it a bit difficult to do everything 100% the way I want. While we stuck numbers to the bugs we talked about their number names and we pointed out each number and tried to identify it. We also practiced counting from 1-10. Once my 5 year old got home he had to try it too. I worked on making it a bit harder for him by having him add all the numbers together on each bug. Sticky walls are such a simple way to make learning fun in a different way. Have you ever made one? 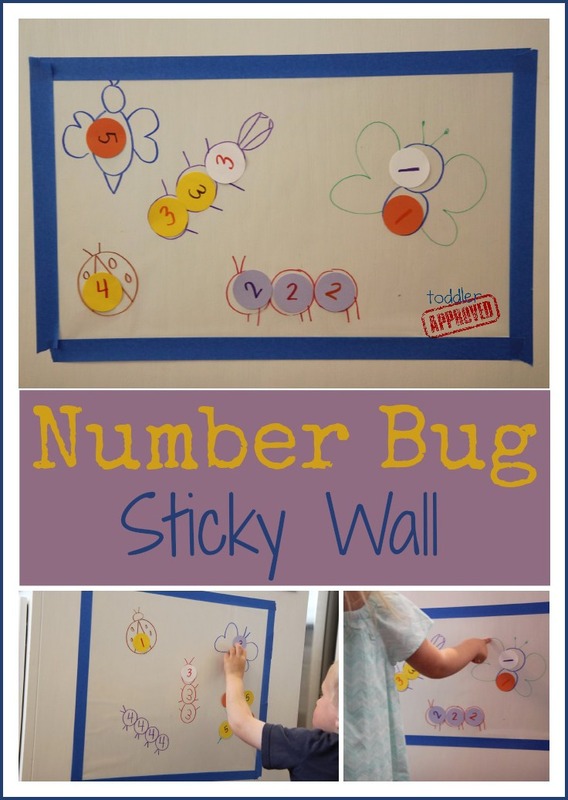 If your kids don't like bugs, what theme would they pick for this number sticky wall? Allie at No Time for Flashcards is sharing ten great sticky walls and murals today on her blog... so if you want more ideas, head on over there! Allie was the person who introduced us to sticky wall murals and we are so grateful! The workers have arrived and are now cutting tile, so we're off to the park for another bug hunt. Hope you have an awesome day!